cross IndiaIt is that time of the year. The entire internet eco-system wants to read Mary Meeker’s annual internet report. This year there has been a substantial focus on India (55 slides – slide 232 to 287). Internet penetration is at 27%, 355 million of 1.3 billion in India are online (there is still a lot of room to grow, good news). 72% of these 355 million (255 million) internet users are < 35 years old. 64% of the 1.3 billion Indians are < 35 years old. Internet consumers benefitting from Competition & Government policies. Broadband subscribers can be far higher provided telcos start providing high-speed broadband across India, even in a city like Bengaluru we cannot get high-speed broadband in all localities. We need a Minister dedicated to infrastructure which will help grow Internet usage in India. Smartphone shipments in India grew 15% in 2017 Q1 year-on-year (Jan-Mar). The number of app downloads from Google Play Store in India higher than the US. Annual price of 1 GB of data / month: $53 in Q1 2014, $23 in Q1 2017. Wireless data consumption in millions of GB per month: 1,300 in March 2017, grew 9x Y-o-Y (Reliance Jio can take the credit for this hockey stick effect). UC Browser is the most popular mobile browser in India. Narendra Modi’s government is focused on Pro-Digital Policies: Digital India, Startup India, GST, BHIM banking app. Mobile share of web traffic (Jan 2017): 80% (vs 50% global average). Time spent per week: Print (2 hours), TV (4 hours), Mobile (28 hours). While the consumption of local language content has indeed grown, a lot more needs to be done in this space. Govt of India needs to embrace local language more aggressively. VCs in India yet to give the importance it deserves. Banks, ecommerce sites, mobile apps – all of them need to add local language support. Only then the real utility of local language can be seen. 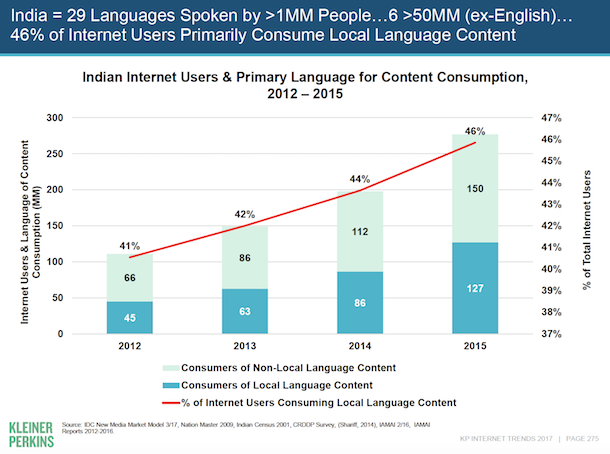 Nearly 50% of the 355 million internet users in India consume local language content. The majority of big funding has gone to ecommerce in India. While startups did attract a decent amount of angel funding, it was not the case when it came to Series A funding. Venture Capital Funding saw a slowdown in India: $7.6 billion in 2015 vs $4.7 billion in 2016. 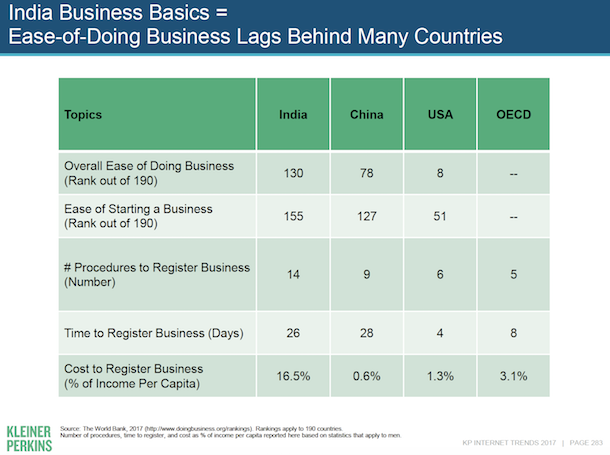 For startups to do well we need to make it far easier to do business. Since 2014 things have become better but the government can do a lot more. While ad revenue from mobile apps have been good in India, the same from mobile web (WAP) has been a challenge. Wish Indian ad market for mobile web could command the same rates as in the US. The video version can be seen here.